At the end of Game of Thrones season six, with the offing of Margaery Tyrell at the hands of Cersei Lannister’s Sept Kaboom!, it seemed that Cersei has finally put the kibosh on the “younger, more beautiful (queen)” prophecy she received from Maggy the Frog as a child. Cersei believed Margaery to be the younger, more beautiful queen of the prophecy, but was she really? Margaery didn’t completely cast Cersei down when she rose to power, but as Cersei sees it, she tried to take “all she holds dear,” namely Tommen. While Cersei rose from the ashes, she still lost her last living child. Did Cersei beat Maggy’s prophecy? Let’s take a look at the prophecy as stated in the show. You will be queen, for a time…until there comes another, younger and more beautiful, to cast you down and take all that you hold dear. There are a few things to consider regarding this prophecy. First, is it real? Cersei seems to believe so, which seems to be the important thing. For sake of argument, let’s say that it is, as prophecies tend to have an important role in the Game of Thrones universe. Is the younger, more beautiful queen (abbreviated as YMBQ going forward) still in play? If so, who should Cersei fear the most? Here are the contenders going into season 8. Perhaps the most obvious contender for YMBQ is Daenerys. Dany certainly has the most fire power (*rimshot*) available when it comes to casting Cersei down. Dany’s dragons are the Westerosi equivalent of nuclear bombs, so she’s got the most power available to cast Cersei down of all the contenders, not even taking into consideration her Unsullied and Dothraki armies. Daenerys is also younger, and based on the fact that nearly every man that lays eyes on her wants to jump in her bed or follow her to the ends of the earth, “more beautiful,” would be an apt descriptor. However, what does Cersei hold dear enough that Daenerys could take? The Iron Throne? The kingdom? It’s difficult to speculate fully on that last point in the context of Daenerys. Will Daenerys win the title of YMBQ? She hits three out of four YMBQ requirements. Bonus: Daenerys’ birthright makes her a frontrunner for Queen, if you prefer your rulers by original succession, but she’ll have to take it back by conquest first. Sansa Stark brings a lot to the table when it comes to being YMBQ. She has been manipulated, used, and hated by Cersei. She is younger and more beautiful than Cersei, and of all the contenders, Sansa probably has the most personal reasons for wanting to see Cersei come to an untimely end. Who could blame her? But does Sansa have the capacity to cast Cersei down? Of course, she could use the armies at her command to do so. I’m thinking mainly of the armies of The Eyrie and even the Tully forces at Riverrun, if her Uncle Edmure could be persuaded. If what Cersei holds dear is her own life, I think Sansa’s command could take it. I don’t think Sansa is interested in the throne. However, based on her refusal to go anywhere near Cersei in the season 7 finale, sending Brienne to the Dragon Pit in her stead, it seems that Sansa would just prefer to be left alone. I’ll give Sansa two and a half out of four YMBQ requirements, only because while she has the capacity to use her armies to directly attack Cersei, it seems unlikely that she would do so. Brienne of Tarth is an interesting consideration for YMBQ. At first blush, she might not even show up on the radar as a candidate for the title. Let’s go down the list to see if she fits the bill. Brienne is younger than Cersei. Check. While Brienne does not meet the standard of conventional Westerosi beauty, she does bear the moniker, “Brienne the Beauty,” given to her as a young girl–a name meant to hurt. However, Brienne arguably has the most beautiful spirit of any character in Game of Thrones. She is good, kind, loyal, and perhaps the most honorable person in all of Westeros. Her kindness is attractive and wins her the respect and admiration of all who get to know her. From this perspective, it can be argued that Brienne is more beautiful than Cersei. Heck, in that respect, she’s more beautiful than Cersei by leaps and bounds! Prophecies are not always what they appear. Could Maggy the Frog have been referring to Brienne’s beautiful heart or her moniker of “The Beauty”? I think it’s a real possibility. So, more beautiful? Check. Now, what about “cast you down and take all you hold dear”? Brienne is more physically capable to take down Cersei than the two previous candidates. Dany has dragons and armies, Sansa has armies, but without them could either of them take down Cersei? Likely not, though it might be entertaining to watch Dany, Sansa, and Cersei have an all out throw down. However, when it comes to fisticuffs, Brienne has her arm. She is not one to attack unprovoked, though. She uses Oathkeeper in defense and in the protection of others, never for attack. With so much on the line in season 8, I think we may see Brienne in circumstances where this is something that could happen. Perhaps instead of a direct attack, Brienne may be leading the charge to dethrone Cersei. What if Brienne loses her cool when she hears how Cersei commanded The Mountain to kill Jaime Lannister? We all know how protective Brienne is of her people. Keeping these things in mind, it’s clear that Brienne has the capacity to cast Cersei down all on her own. Cast you down? Check. Now, that leaves the final part of the prophecy–“take all you hold dear.” Again, what does Cersei hold dear? When it comes to Brienne, I think her conversation with Cersei back in season 4, episode 2 is very telling. CERSEI: I owe you my gratitude. You returned my brother safely to King’s Landing. BRIENNE: In truth, he rescued me, your grace. More than once. CERSEI: Did he? I haven’t heard that story before. BRIENNE: Not such a fascinating story, I’m afraid. CERSEI: I’m sure you have many fascinating stories. Sworn to Renly Baratheon, sworn to Catelyn Stark, and now my brother. It must be exciting to flit from one camp to the next, serving whichever lord or lady you fancy. BRIENNE: I don’t serve your brother, your grace. CERSEI: But you love him. In this scene, Cersei marks Brienne as a rival. She makes sure that Brienne knows that she’s watching her and that Jaime is off limits to anyone but Cersei. Couple this scene with the five seconds of awkward three-way staring in the Dragon Pit in the season 7 finale, the thing that Cersei truly fears will be taken from her is Jaime and the one person she fears taking him is Brienne. Take all you hold dear? Check. 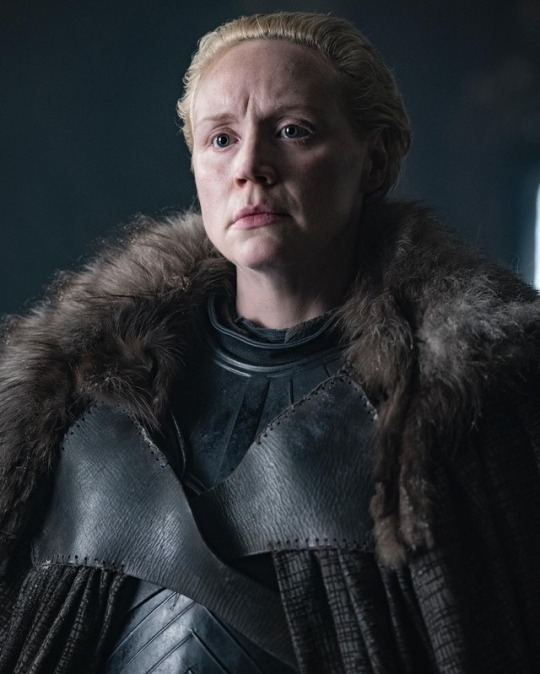 By these standards, Brienne of Tarth is four for four for the YMBQ title, making her the top contender to topple Cersei. Bonus: If Brienne and Jaime get married and Cersei is indeed cast down, Jaime is the next in line for the Iron Throne by rule of succession, making the questionable Queen title a reality. It would seem the odds are ever in Brienne’s favor. For fun, let’s consider Arya Stark as a potential wild card candidate for YMBQ. Arya definitely qualifies as younger. If we go with how Arya is described in the books, “Arya Horse Face”, perhaps she’s not more beautiful than Cersei. However, that doesn’t change the fact that Maisie Williams is all kinds of adorable, so for show canon, let’s say yes. Two points for Arya on these counts. As for “cast you down and take all you hold dear,” we have seen how more than capable Arya is when it comes to casting people down that cross her. Just ask House Frey. There’s also the little matter of Arya’s list. Is she still working on it? Before Arya ran into Hot Pie at The Inn at the Crossroads, she was on her way to King’s Landing to let Cersei have it. Also, among my circle of friends, there has been speculation about Arya defacing Bernadette the Vulcan maid in order to get close enough to take out Cersei. However, with Arya’s turn at The Inn at the Crossroads, she also seems to have shifted a bit from a murderous revenge baby, to someone who wants to deal out justice, as seen with the “judge, jury, and executioner” bit she and her siblings enacted on Littlefinger last season. Arya is definitely capable of casting Cersei down, and considering her track record, she is perhaps more liable to do so than the other aforementioned candidates. However, she may have had a change of heart. I’m not saying that she couldn’t take down Cersei, I’m just not sure that she will. For this reason, I don’t know that I can give Arya full marks on this point, so we’ll say half a point. “Take all you hold dear” is a tricky one when it comes to Arya. I don’t think Arya really wants anything that Cersei potentially holds dear, save for her life. One final thing to consider is that Cersei is a narcissist and it can be difficult to gauge what she may hold dear or value at any time. Narcissists seem to value whatever gives them the most power and control, and at least for Cersei, that seems to change by the minute. For this reason, I feel like I can only properly give Arya half a mark on this point because I don’t think Arya is after anything that Cersei particularly values. In total, Arya Stark as a wild card gets three out of four points in the running for YMBQ. The final score from lowest to highest for our younger, more beautiful queen candidates are as follows. So, I’m calling it, Brienne of Tarth stands the best chance of toppling Cersei’s reign of power. Do you agree? Who do you think? Did I leave someone out? Leave a comment with your thoughts! 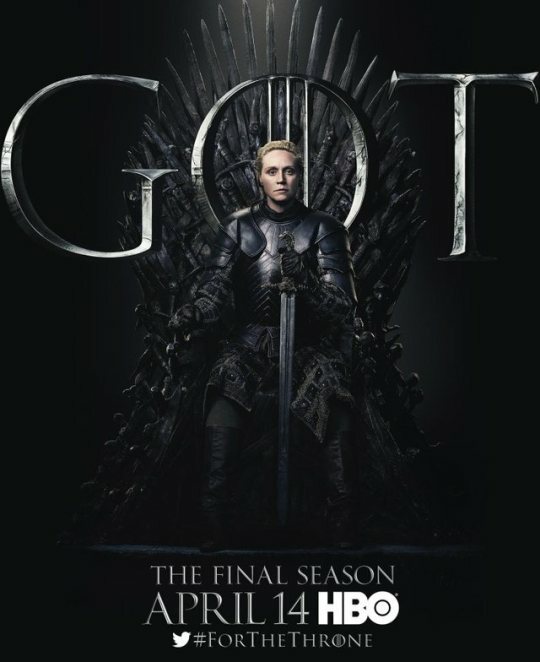 Game of Thrones Season 8 will premiere April 14th at 9/8c on HBO. Ashley Thomas is The Nerdy Blogger. She holds a B. A. in English Literature from Maryville College in Maryville, Tennessee (c/o 2007) and a M. A. at Signum University in Literature and Language, concentrating in Imaginative Literature (c/o 2018). Ashley blogs, reads, writes (for fun and for hire), and spends time with her husband, Ryan, and their two cat-monsters, Luna and Oliver. She and Ryan reside with a large quantity of board games, comic books, and polyhedral dice. She would like to be Brienne of Tarth, Leslie Knope, and Hermione Granger when she grows up.